In its continued effort to forge ties with campus journalism programs, the Evangelical Press Association has established a partnership with the Advisers of Christian Collegiate Media in a program that will bring EPA member publications top student interns from Christian colleges and universities nationally. “Interns, when they’re brilliant, can bring zest, energy and new ideas to a publication or media group. It’s a proven formula,” said Dr. Michael Longinow, executive director of ACCM and a long-time adviser to campus publications in two regions of the U.S.
ACCM is a network of advisers at Christian colleges and universities that adhere to an evangelical mission (the Nicene Creed). Member schools are spread from California to New York and from Minnesota to Texas. ACCM meets alongside EPA in its annual spring convention, bringing students into the event as they participate in the EPA media contest and learn alongside working professionals in workshops. To participate in the new internship program, students will go through an application process with the ACCM board of directors. That application will screen students based on prior media experience, commitment to career preparedness, and a passion for practical learning. 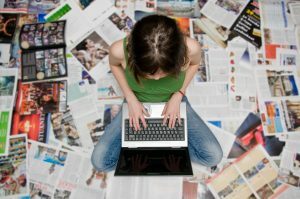 Students with prior media internships and who have extensive campus media experience or media leadership will get special attention in the process. EPA publications will submit a request for an intern which will be disseminated to the participating colleges and universities to find suitable matches from the screened candidates for the publications to interview. Some of the most prestigious internship programs in the nation are partnerships between media organizations and host groups, among them the Dow Jones News Fund, the Pulliam Fellowships, and the American Society of Magazine Editors internships. In each of these partnerships, students are actively mentored by working professionals as they participate as pseudo-staff members earning bylines and practical experience in the workplace. Host publications and media groups within EPA that take on ACCM interns will agree to mentor, encourage, and guide student journalists to increased confidence in the media workplace. As interns work on deadline, they will earn bylines, photo credits and put their ideas to work in multimedia projects alongside seasoned publications media staff. To participate in the internship program, EPA membership is required for both the publications seeking interns as well as the colleges offering interns. Requests for interns should be submitted from three to six months in advance.